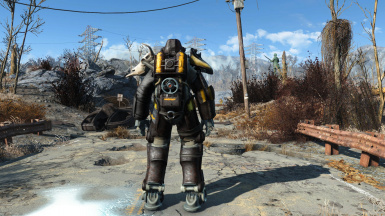 Adds the Tribal T-45 Power Armor and the Metal Blaster Laser Rifle from Fallout 3 with a small retrieval quest too. All assets in this mod originally belong to NewerMind43 whom has given me permission to use them on this mod. 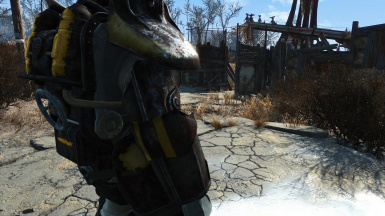 If you want to use any assets included in this mod you must ask NewerMind43 first. First of all, apologies for not releasing anything new for a while, I have gotten a job that takes much time and energy so modding has had t o take second place in my life. Now for the mod. 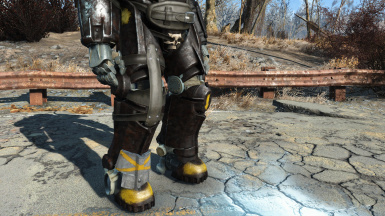 Welcome to yet another Fallout 3 classic release, in this pack you will find the Tribal Power armor, modeled and textured by NewerMind43 and the Metal Blaster Laser Rifle weapon, it bears no new models but has the unique effect of 9 beam fire. 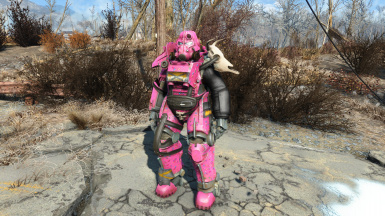 I have tried to replicate the Power Armor special wise as accuaratedly as I could. 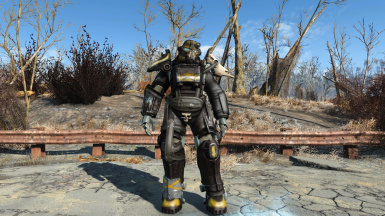 Each Piece, excluding the helmet carries one of the Special stats the armor had in Fallout 3, the unique texture that the armor has can also be appled to any other T-45 in the game and the Tribal Power Armor can wield any paint compatible with the T-45. Damage wise the weapon is identical to that of the games base laser weapon, but the unique feature comes from the fact that it fires 9 beams which scatter a lot less than the beam splitter, making Metal Blaster a true Laser Shotgun, at least, I hope so. The gun is fully modifiable with the exception of muzzles, I felt that muzzles could hinder the splitted beam so I decided to leave them out. The quest is a simple go here, kill target, retrieve loot and is added to your quest list upon launching the game. I know many of you have wished for more detailed quests, I will try to learn them when I have time but for now my job takes up most of it. Thank you for downloading and hope you enjoy the stuff none the less. 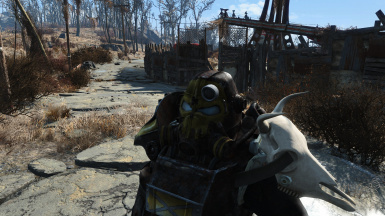 NewerMind43 for allowing me to make my own version of the mod and use the models. and the community for all the tools without this would not be possible.